This year Chanukah begins at sunset on December 16, and ends on December 24. 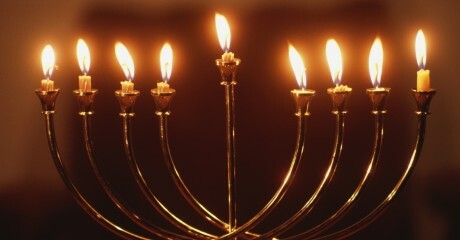 Chanukah, or the Festival of Rededication, celebrates the rededication of the Temple in Jerusalem after its defilement by the Syrian Greeks in 164 BCE. Families can celebrate the Festival of Lights in many ways in the Philadelphia are and suburbs. Celebrate Hanukkah with festive song, story times, arts and crafts, a game of dreidel, and more on December 21 at 1 pm. Attendees will be given half-price admission to the National Museum of American Jewish History and their new exploration of holiday music, ‘Twas the Night Before Hanukkah! The public menorahs will be lit each night, but the exact timing varies due to observances of the Jewish Sabbath on Friday and Saturday nights and other scheduling details, so check before you go at www.hanukkah.org/events . You can also take part in the annual menorah car parade in South Jersey. On Sunday, December 21, 2014 free menorahs will be affixed to car rooftops at Chabad Center’s starting point beginning at 4:30 p.m. The caravan of candle-topped cars will depart at 5 p.m. from Chabad Lubavitch at 1925 Kresson Road in Cherry Hill and arrive at Saharah Sam’s Oasis at 5:45 p.m. for a menorah lighting at 6 p.m. For more information, contact Chabad Lubavitch at 856-874-1500 or visit www.thechabadcenter.org.